It’s not surprising that the new Karthi starrer has been roundly panned. It’s another film with a great idea and not-great writing. But at least when it comes to the core conceit, Dev is not just all talk. This is, at heart, a love story, but infused with the spirit of adventure. 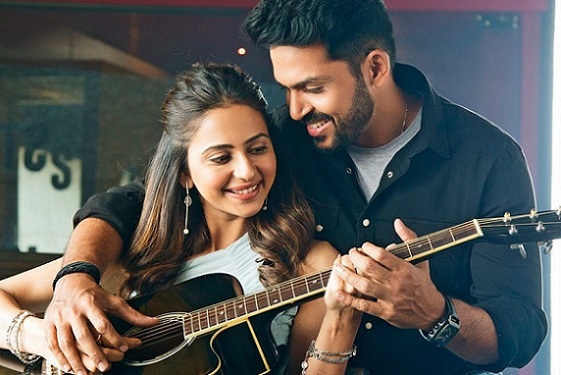 Dev falls for Meghna (a thoroughly miscast Rakul Preet Singh, glamming it up in a role that required some serious acting). She’s a big-time achiever, the boss of her own multi-megabucks company. She’s the kind of person whom Dev was lecturing his friend about, the kind that has ticked off each box in the Society’s Expectations list. Dev’s idea of a peak is something that rests on Mount Everest. To Meghna, it’s a crest on her company’s finance chart. Will the two worlds meet? Will the two worldviews meet? Will Mr. Adventure and Ms. Achiever find true love? Mank: I second the motion😊. Reading this article, I am reminded of Petta. Maybe that film too warrants a similar write-up. While KS’s writing is nowhere as bad as Dev, considering his prior films(especially Pizza), Petta is indeed a flop in the screenwriting department. But then again, Petta was not a product of the director KS. It was that of the rajini fan KS. Am in the minority, to feel highly irritated with these hansikas, Preet Singh’s and the n number of other similar looking imports who can’t even mouth a couple of lines convincingly. Your rules of screenplay writing reminded (actually, a little too strongly) of this lovely short by Mark Twain… Fenimore Cooper’s Literary Offences. Were you by any chance inspired by that? If not… Check it out ! Clearly , Screenwriting is thoroughly neglected area. It helps to have second eye on directors idea or vision. We could see how Mani Ratnam’s and shankar’s films are suffering in screenwriting department post demise of gifted writer Sujatha. This is not to say that their concepts are not grand. For instance , KADAL was boldest attempt till date by mani ratnam …however having writer like sujatha would’ve taken film to altogether different level. Vetrimaaram made interesting observations on why screenwriting cannot be a stand alone profession in tamil cinema barring few exceptions , in his talk on SWA conference. It clearly shows we lack professional approach towards screenwriting. Theoretically speaking , every film would need support from writer like Sujata , MT Vasudeva Nair , Salim javed so director can interpret the fully fleshed out script visually and add another layer. But we have long way to reach there. I am so glad I watched this. Do the film makers don’t watch their end product? Rakul was so fake the whole movie, it was super cringy! However like how Alia says in Dear Zindagi, films like these provide more motivation in the form of “I can do better than this!” for aspiring filmmakers out there.